This image of Ceres, taken by NASA's Dawn probe on Feb. 19, 2015, from a distance of about 29,000 miles (46,000 kilometers), shows two mysterious bright spots on the dwarf planet's surface. The new photos of Ceres from NASA's Dawn spacecraft, which is scheduled to arrive in orbit around Ceres on the night of March 5, reveal that a puzzling bright spot on the dwarf planet's surface has a buddy of sorts. "The brightest spot continues to be too small to resolve with our camera, but despite its size, it is brighter than anything else on Ceres," Andreas Nathues, lead investigator for the framing camera team at the Max Planck Institute for Solar System Research in Gottingen, Germany, said in the same statement. "This is truly unexpected and still a mystery to us." Dawn will begin investigating the many mysteries of Ceres — the largest body in the main asteroid belt between Mars and Jupiter — in earnest soon enough. After reaching Ceres' orbit next week, the probe will spend about six weeks working down to its first science orbit, getting there on April 23. Mysterious bright spots are visible in these images of the dwarf planet Ceres, taken by NASA's Dawn spacecraft on Feb. 19, 2015 from a distance of about 29,000 miles (46,000 kilometers). 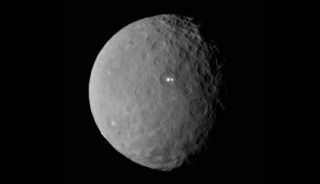 Dawn observed Ceres for one full rotation, about nine hours. Dawn launched in September 2007 to study the asteroid belt's two largest denizens, the 590-mile-wide (950 km) Ceres, and Vesta, a protoplanet about 330 miles (530 km) in diameter. Dawn's observations of these planetary building blocks should reveal key insights about the solar system's early days and the planet formation process, mission team members say. Dawn's spaceflight feats are enabled by its superefficient ion propulsion system, which accelerates ionized xenon gas out the back of the spacecraft to generate thrust.